If you are a stamp collector, or know someone who is, the new U.S. Postal Service Stamp featuring the Columbia River Gorge might be the next stamp on your list to collect. The stamp offers beautiful artwork of the Gorge, but the $22.95 Priority Express Mail stamp is also the first stamp ever produced to exceed a $20 denomination. The United States Postal Service has produced its first postage stamp to exceed a $20 denomination: the $22.95 Columbia River Gorge Priority Express Mail stamp was issued Jan. 17. It is also the first U.S. stamp printed by Banknote Corporation of America using a plate number beginning with the letter B. A second stamp intended for Priority Mail use, printed by Ashton Potter USA Ltd., was issued at the same time: a $6.45 La Cueva del Indio stamp. Both stamps were issued without ceremony in Washington, D.C., rather than at the scenic locations that they depict. The stamps are the latest high-denomination stamps to feature the artwork of illustrator Dan Cosgrove in the American Landmarks series, which began in 2008 with the $4.80 Mount Rushmore stamp (Scott 4268) and the $16.50 Hoover Dam stamp (4269). With the addition of the two new stamps, the series depicts 16 different natural or manmade sights from a dozen or so states and Puerto Rico. Each stamp in the series has fulfilled the rate in effect at the time for either the Priority Mail or Express Mail flat-rate envelopes. Because these rates have increased over time, the face value of each newly issued expedited mail stamp has also climbed. A 5¢ drop in the Priority Mail rate in 2010 provided the only exception. The new stamps have been issued in self-adhesive panes of 10. Collectors have the option of purchasing press sheet segments consisting of 60 stamps for the $6.45 stamp, or 30 stamps for the $22.95 stamp. Both denominations are being offered with two varieties of sheet segments, either with or without the die cuts that normally separate individual stamps. The quantities issued are 300 sheets of the $6.45 stamp with die cuts and 500 sheets without, selling for $387 for either variety; and 100 sheets of the $22.95 stamp with die cuts, and 250 sheets without, priced at $688.50 for either variety. La Cueva del Indio (“the cave of the Indian”), shown on the $6.45 stamp, is an archaeological site on Puerto Rico’s north coast, near Arecibo, about 50 miles west of San Juan. The area was declared a natural reserve in 1992 by the Planning Board of Puerto Rico, and it is managed by the Puerto Rico Department of Natural and Environmental Resources. The reserve extends nine nautical miles into the Atlantic Ocean and includes coral reefs and sea turtle nesting areas. Almost 4,000 miles to the northwest of La Cueva del Indio is the Columbia River Gorge, featured on the $22.95 stamp. The 85-mile-long gorge is situated in the Pacific Northwest along the border separating Washington and Oregon, with the Columbia River running through it on its way to the Pacific Ocean. The view in Cosgrove’s illustration shows Crown Point, some 730 feet above the river, and the historic stone structure known as Vista House, which was built by Multnomah County between 1916 and 1918. The Columbia River Gorge National Scenic Area was created on Nov. 17, 1986, when President Ronald Reagan signed the National Scenic Area Act. “A total of 292,500 acres were designated for special protection on both sides of the Columbia from the outskirts of Portland-Vancouver in the west to the semi-arid regions of Wasco and Klickitat counties in the east,” according to the Columbia River Gorge Commission. The Postal Service has created standard black four-bar first-day cancels for each of the two stamps, as well as individual digital color postmarks for each. The La Cueva del Indio color postmark has the name spelled out in blue, green and red lettering, while the Columbia River Gorge color postmark shows five green trees with “Columbia River Gorge” spelled out across them. The Postal Service sells first-day covers marked with these postmarks on plain white envelopes. Technical details and first-day cancel ordering information for the $6.45 La Cueva del Indio Priority Mail stamp and the $22.95 Columbia River Gorge Priority Express Mail stamp are presented below. FIRST DAY— Jan. 17, 2016; city— Washington, D.C., and nationwide. PRINTING: process— offset with microprinting; printer and processor— Banknote Corporation of America, Browns Summit, N.C.; press— Alprinta 74; inks— cyan, magenta, yellow, black; paper— prephosphored overall tagged; gum— self-adhesive; issue quantity— 1.5 million stamps; format— pane of 10, from 150-subject cylinders; size— 1.42 inches by 1.085 inches (image); 1.56 inches by 1.225 inches (overall); 4.12 inches by 7.12 inches (full pane); 4.12 inches by 21.36 inches (press sheet); plate numbers— “B” followed by four single digits; marginal markings— plate numbers in two corners (stamp side); “©2015 USPS,” plate position diagram, USPS logo, UPC code in two corners, UPC code behind each stamp; website information; USPS item No.— 119300. Collectors requesting first-day cancels are encouraged to purchase their own stamps and affix them to envelopes. The first-day cover envelopes should be addressed for return (a removable label may be used), and mailed in a larger envelope addressed to Columbia River Gorge Stamp, Special Events, Box 92282, Washington, DC 20090-2282. Requests for first-day cancels must be postmarked by March 17. 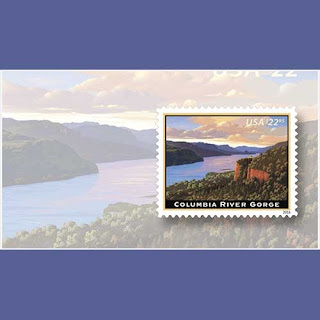 The Postal Service’s uncacheted first-day cover for the Columbia River Gorge stamp is USPS item No. 119316 at $23.39. USPS order numbers for stamps and FDCs also appear in Linn’s 2016 U.S. Stamp Program.